HEARTS captain Alim Ozturk is to visit a specialist this week in an effort to diagnose the exact nature of his injury problem. He will travel to Bradford on Wednesday to consult the surgeon who performed his hernia surgery during the summer after getting recurring pain from the same area. 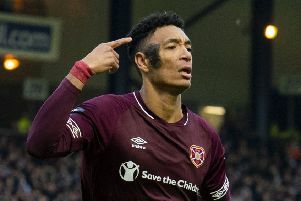 The centre-back has not featured in Hearts’ last two matches and was left out of the squad for Saturday’s 1-1 draw with Kilmarnock. He has also been forced to sit out of training sessions because of the discomfort and medical staff at Riccarton want to get to the root of the problem. Ozturk will travel south on Wednesday hoping to learn why he is continually feeling pain. With Hearts inactive until a week on Sunday due to the international break, he will hope that rest will be sufficient to cure the complaint. “Alim is seeing a specialist because we need to find out exactly what the problem is,” explained Robbie Neilson, the Hearts head coach. “He is still getting pain and it’s caused him to miss some training sessions and things like that. It’s not fair on him so we want to get it dealt with as quickly as we can. Ozturk was an unused substitute at Celtic Park prior to Hearts’ stalemate with the Ayrshire side on Satuday. He has made ten appearances in total, scoring two goals, in his first season as captain of the Edinburgh club.